Understand Want to know more? Deepen your understanding of Blind Spot Monitors. Challenge Up for a challenge? Tackle a few challenging scenarios using Blind Spot Monitoring. Blind Spot Monitoring (BSM) helps you detect cars in hard-to-see areas, commonly known as “blind spots.” BSM may also be called Blind Spot Information Systems, Blind Spot Detection, or Blind Spot Warning. BSM systems monitor the blind spots on both sides of your car. When a car is detected, a yellow or red indicator will light up in the side mirror or on the window frame. Some systems also provide a warning sound. 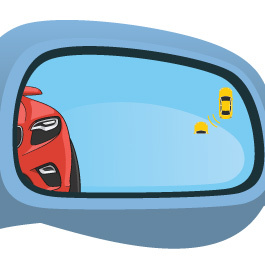 BSM helps you to avoid crashes that occur in blind spot areas. They are most effective when your car is passing, being passed, or preparing to make a lane change. 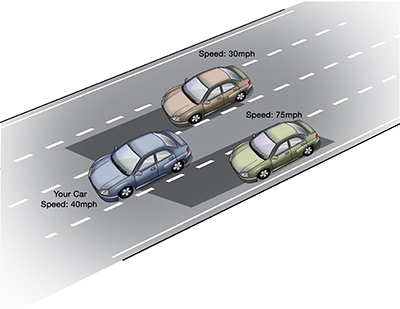 In some cars, BSM is activated when you drive above a certain speed. The warning light will briefly illuminate in both outside rearview mirrors or window frames to let you know that the system is operational. It remains on while the transmission is in DRIVE and NEUTRAL. You can then choose to turn it off. In some cars, you will need to switch the system on or off manually by pressing the BSM button. Most Blind Spot Monitoring systems use radar sensors, but some use cameras. The sensors are usually located under the rear bumper or side view mirrors. The sensors monitor the areas behind and next to your car. 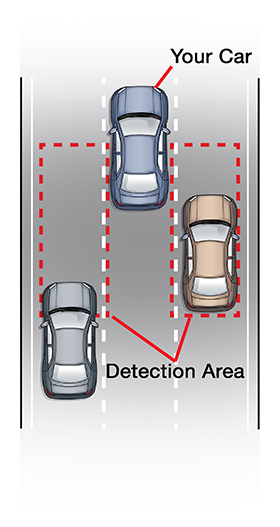 The detection area covers approximately one lane width on both sides of your car. It extends from the side view mirrors to approximately 10 feet beyond the rear bumper. BSM detects cars entering your blind spots from the side, rear, and front. 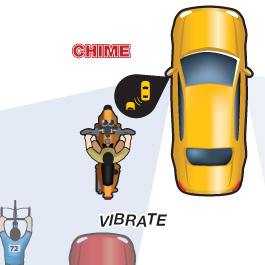 When a car is detected, a yellow or red light will light up in the corresponding side mirror or window frame. Some systems emit a warning sound as well. In some cars, if the turn signal is on when there is a car in your blind spot, the steering wheel will vibrate briefly and the indicator light will flash brightly. detect small objects such as motorcycles and bicycles. In this image, when the motorcycle is in your blind spot, the BSM indicator may not light up because the sensors do not detect it. 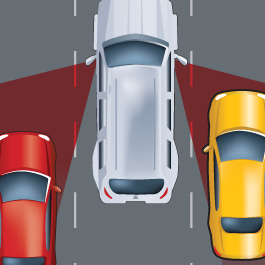 The detection area of your Blind Spot Monitoring is based on the lane width of typical highways. Therefore, when you drive on a road with unusual lane width, your BSM may not work properly. Suppose you are driving on a road with a lane width of 12 feet. And suppose the width of each BSM detection area is 15 feet. Using this information and image, answer the question below. What would your BSM detect? Why? What would your BSM detect? Why? I am driving on a road with narrow lane width. My BSM may detect the car two lanes away, because that car may be in my detection zone. Your Blind Spot Monitoring detection areas extend from the side view mirrors to approximately 10 feet beyond the rear bumper. However, the detection areas do not change if your car is towing a trailer. 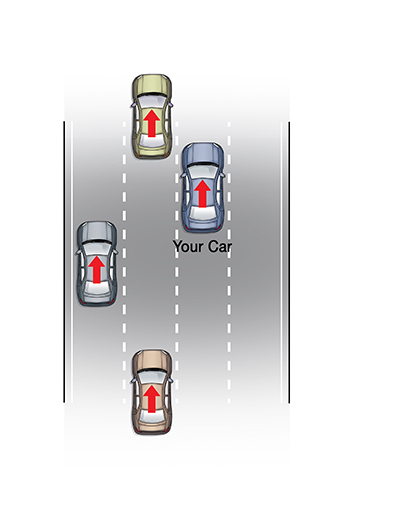 You should visually verify the next lane is clear for both your car and trailer before making a lane change. In this image, suppose the gray area is the detection area of your Blind Spot Monitoring. 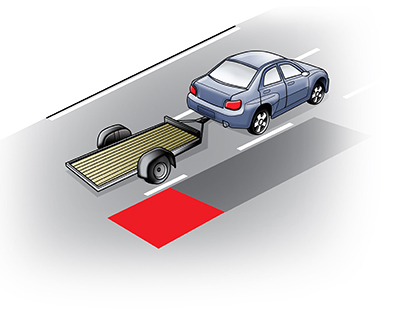 It does not extend to the red area, which is part of your blind spot areas when your car is towing a trailer. If another car enters the red area, the BSM indicator will not light up. 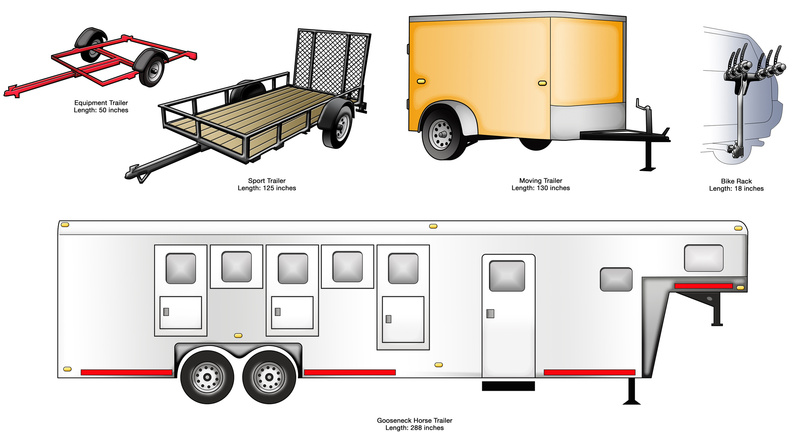 When you are towing each of the following trailers, would you potentially have any problem using your BSM? Why or why not? Would you have any problems towing these objects? Why or why not? Would you have any problems towing these objects? Why or why not? The bike rack will not cause problems. The equipment trailer should be fine too. I should not depend on my BSM when towing the moving trailer, sport trailer, or horse trailer, because those are longer than 10 feet and will not be covered by my BSM’s detection area. 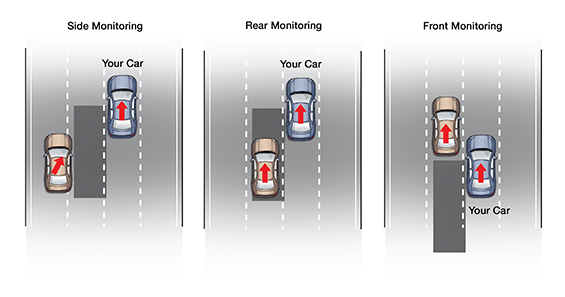 Your Blind Spot Monitoring system has a “speed difference range.” If your BSM’s speed difference range is 30 mph, and you are driving 30 mph faster or slower than another car, then your system may not detect that car. The speed difference range is 30 mph in most BSM systems. In this image, your BSM can detect the green car, but not the tan car. This is because the difference in speed between your car and the tan car is 35 mph, which is greater than your speed difference range. Imagine yourself driving the blue car. Suppose your BSM speed difference range is 30 mph. Use this information and image to answer the question below. What would your BSM detect? What would your BSM detect? My BSM can only detect the tan car. It cannot detect the green car because the difference in speed between my car and the green car is greater than the threshold. What should you do in this situation? I should visually verify the adjacent lane is clear before making a lane change.